Virginia’s capital city made prime-time news this weekend during an episode of CBS’ 60 minutes about Confederate monuments. In the episode, Anderson Cooper calls Richmond “ground zero” of the debate on Confederate Monuments. Cooper spoke to Richmond Mayor Levar Stoney, and according to the episode Stoney says he’s for taking the monuments down. Also featured in the episode is University of Richmond professor Julian Hayter. Hayter serves on Richmond’s Monument Avenue Commission. As a historian, he told Cooper, he thinks the statues should stay. Just not as they are. “I think we lack imagination when we talk about memorials. It’s all or nothing. It’s leave them this way, it’s tear them down. As if there’s nothing in between that we could do to tell a more enriching story about American history,” says Hayter. 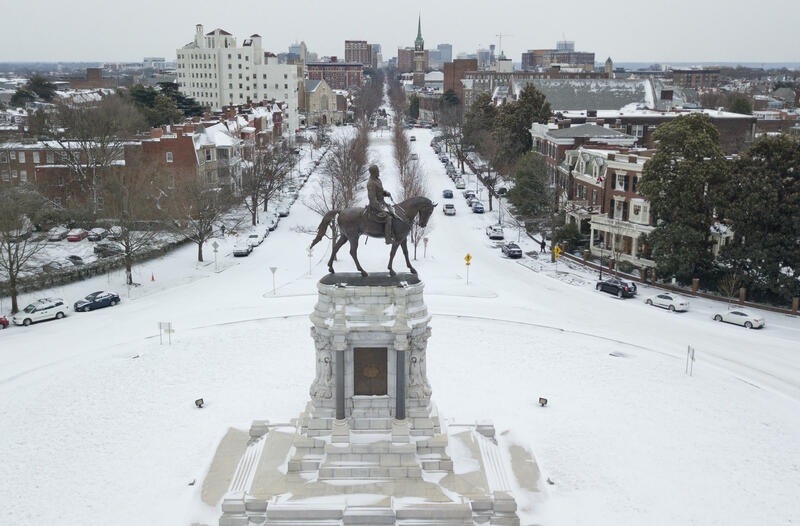 Richmond’s Monument Avenue Commission is currently seeking input on how to deal with the city’s monuments. Community groups can request a meeting with commission members. This report, provided by Virginia Public Radio, was made possible with support from the Virginia Education Association. Charlottesville city council Tuesday took the first steps to yet again change the name of the downtown parks at the center of August 12th’s white supremacist rally. Three months after a white supremacist rally in Charlottesville, Richmond’s Monument Avenue Commission has deemed it time to get back to work. They held a meeting Tuesday evening at the Library of Virginia. Lawmakers in Richmond say all those Confederate monuments in Virginia are staying where they are. Michael Pope is at the Capitol with the latest.